Microsoft Wants to Buy Yahoo? I stumbled across a gorgeous application for the Mac today. Here are a few screenshots from 2 minutes of use. The application disk image comes with a beautiful and self-explanatory installation step. In order to help first-time users, the application shows stickies across the front of the application when it is first launched. Brilliant! 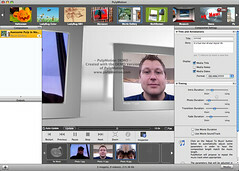 What you get is the ability to create slideshows and animations similar to what iDVD produces, using Quartz. Very elegantly done!